How Did I Become a Soccer Mom? For the past 2 weeks, I have been hopping around from one blog to another and have enjoyed meeting new people. Today is my spotlight day so I am going to start off telling you a bit about me. Chasing My Dreams – Setting goals and going after them makes me happy. 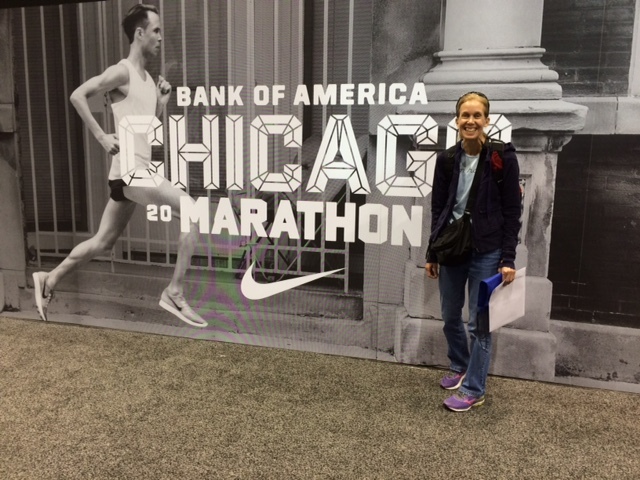 After my long layoff this year, I still ran the Chicago Marathon and BQ’d. When I was still on the course, I set one of my goals for 2016: to marathon in the spring and improve my time for a better corral start. Yummy – My favorite food is chocolate. I’m pretty good about staying away from it. Being lactose intolerant helps. But when I do my own baking and I know that foods are “safe” to eat, I have to really watch that I don’t eat all of the chocolate chip cookies. Nerd – I am such a math nerd. I love looking and analyzing data, especially when it involves running. It’s a good think I teach math. Toenails – I have ugly toenails – really ugly. Running has not been kind to my feet at all. Hot – I love hot weather runs. I love to sweat. I hate all of the winter laundry. Summer laundry is so much easier. Ice – After last January, ice terrifies me. When I fell, I broke my jaw in four places. I was off work for weeks and was forced to stay away from exercise of any kind for weeks and weeks. Even downward dog was dangerous for me to do! I’m not sure how I’ll deal with running this winter yet but I should know soon. Asthma – I developed asthma when I was in my late 20’s. For a while, it stopped me from running. I tried and tried, but I had asthma attacks that simply wouldn’t let me run. I go fed up and took asthma by the horns. Over a few years, I learned to run with it, even in the winter, and can now race as a top Masters athlete in Ontario. I am a Grade 6 and 7 teacher and, from one day to the next, each of my students has something special that makes them stand out, something that makes them shine. It could be a passion for a sport, a favorite hobby that they love to talk about and share, or a general excitement that they bring to class. That enthusiasm makes their eyes shine and makes even the toughest kid smile; it defines who they are. My enthusiasm for fitness and an active lifestyle makes me who I am. Fortunately, the digital age is still fairly young so I can’t post any pictures from the Richard Simmons’ era, when I was bitten by the aerobic bug that eventually led to me teaching aerobics. In the 90’s, I needed more of an adrenalin rush so I turned to running and general fitness training – and I haven’t looked back. Today, if you were to ask someone about me, they would most definitely use the word “runner” in the first two sentences. In the past 25 years, my running has only been halted three times. The first was when I developed asthma – induced by cold and exercise (not great for a Canadian runner) but I spent several years learning how to run with it. 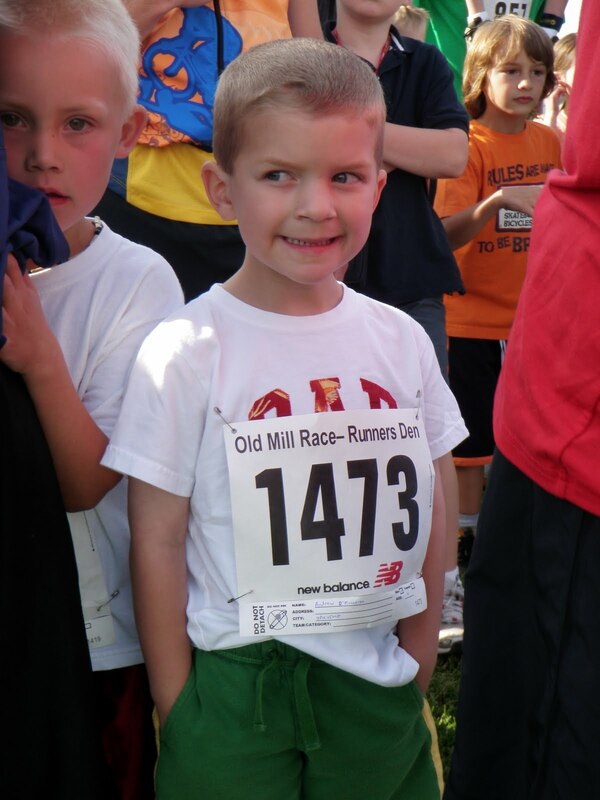 I also stopped running when I was pregnant (my boys are now 9 and 14) as I really didn’t enjoy running while pregnant . So I turned to cross-training – mostly stationary cycling and the stairmaster. My most recent hiatus was this past winter when I broke my jaw while running and, then, had to deal with the deaths of both parents in the spring. After every “rest” period, whether forced or self-inflicted, I could not wait to get back to the roads. So it has always shocked me that my own boys have not been into sports. My husband is an avid hockey player, cyclist, tennis player and occasional runner. 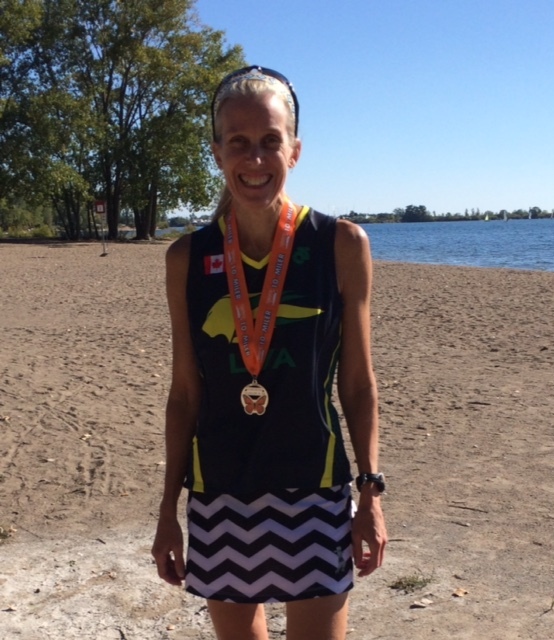 Me: I run competitively (competitive enough to claim the Canadian 50-54 title for the 8K distance). We dreamed about raising superkids with both fast-twitch and slow-twitch fibres, coming from his speed and my endurance. Nope! The Littlest Dude (at 4), ready to go. Over the years, we encouraged both to participate in sports but they showed a combination of low skills and an even lower interest. They came to races with me, cheered me on, and would race the odd Kids’ event. We’d see glimmers of potential and a bit more enthusiasm, but the boys kept going back to the things they loved: music and lego. We couldn’t push them. I wasn’t going to be “that parent” who dragged a screaming child to a swimming lesson or soccer game. But I could plan my training with them in it. I would throw one into a baby jogger or drag them out on their bikes when I ran long. We talked running around the house a lot but, still, there was no real interest. All I could do was hope that they would eventually realize what they were missing. At the beginning of August, like every other August, the two Dudes and I talked about what sports they could get involved with this year. To my surprise, they both said soccer. My oldest has been refereeing for the past year and has taken an interest in the game as a player. 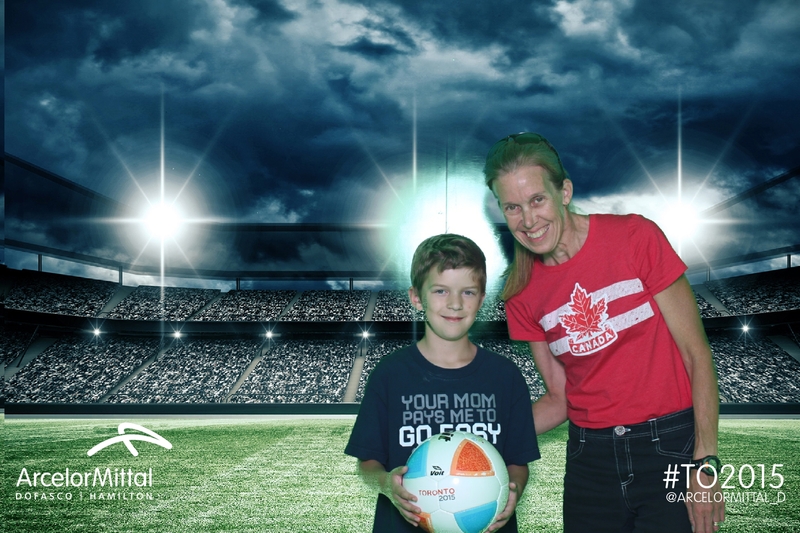 My youngest is either following his lead or was bitten by the soccer bug when we watched the PanAm Games. Either way, it didn’t matter; they wanted to play soccer. At the end of the month, I opened an email: “Coaches Needed for U11 Boys.” Hmmm…. We had a quick family meeting, a few days to digest the decision and I was suddenly coaching the Littlest Dude’s team. So now, a typical weekend for us includes one U11 game, one U15 game, a few games to referee and a load of soccer laundry. This week, Soccer Mom also organized a practice for the team. It looks like the boys aren’t the only ones bitten by the soccer bug. “Where are my soccer socks?” “Can you wash my ref jersey?” “Who do we play this week?” Soccer has quickly become part of the regular language in our house. The boys are excited about it. They smile when they talk about it. Soccer: it defines who they are. 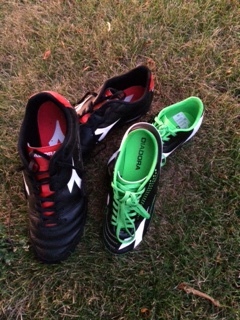 Author CynsspacePosted on November 19, 2015 Categories Fitness and Kids, UncategorizedTags asthma, broken jaw, Chicago Marathon, downward dog, math nerds, PanAm Soccer, soccer mom, Sweat Pink46 Comments on How Did I Become a Soccer Mom?